I took one of my cast iron urns from outside over thinking I might fill it with sticks and create a tree of sorts. 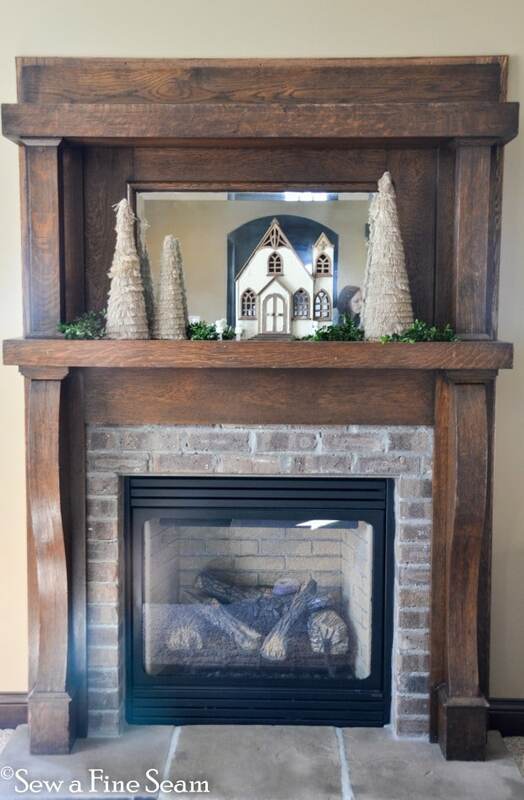 We ended up with this instead and I think it turned out great – perfect spot for an indoor urn. The rug I’ve had for years. 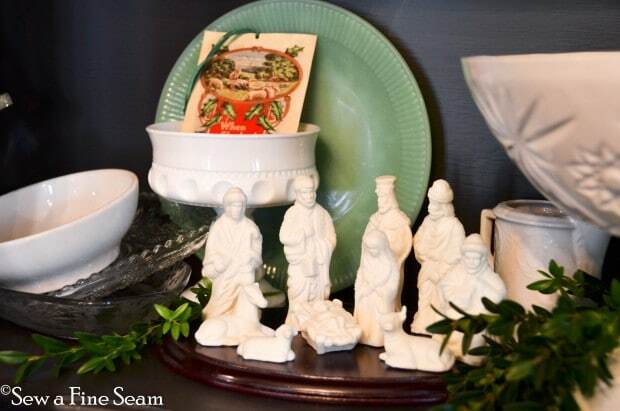 I bought it to put under my nativity and used it for a few years. It’s been packed away for the past several years but it’s one thing I just couldn’t get rid of even though I hadn’t used it for a long time. I’m glad I still had it. Turn around from the front door and the stairway rises beside the dining room and the hallway leading to the kitchen and living room. 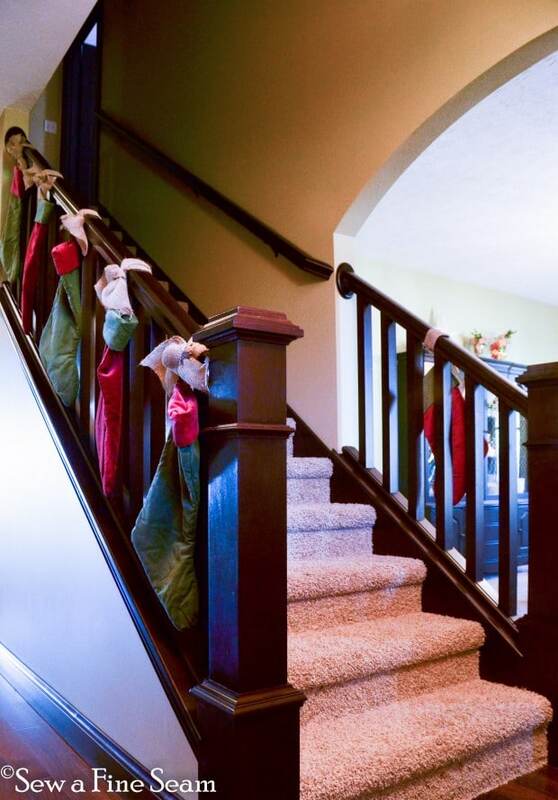 We didn’t want to scratch the woodwork by hanging garlands so we hung the stockings her instead. I love the look! 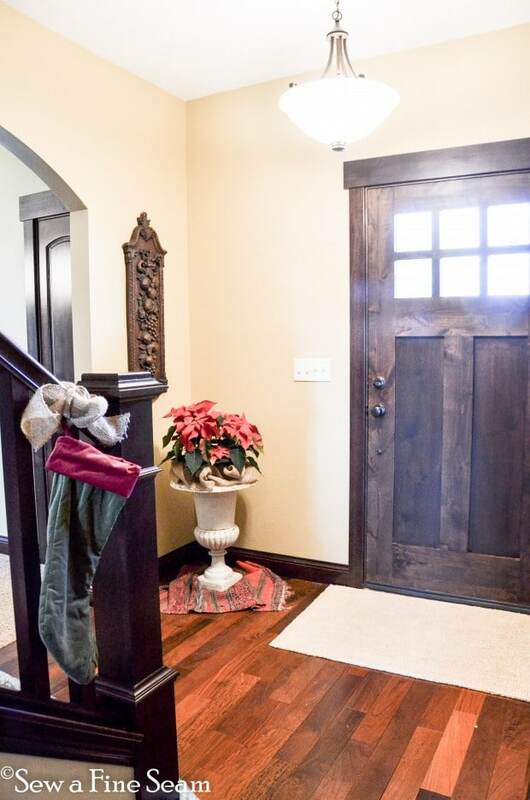 To the right of the front door you enter the dining room. 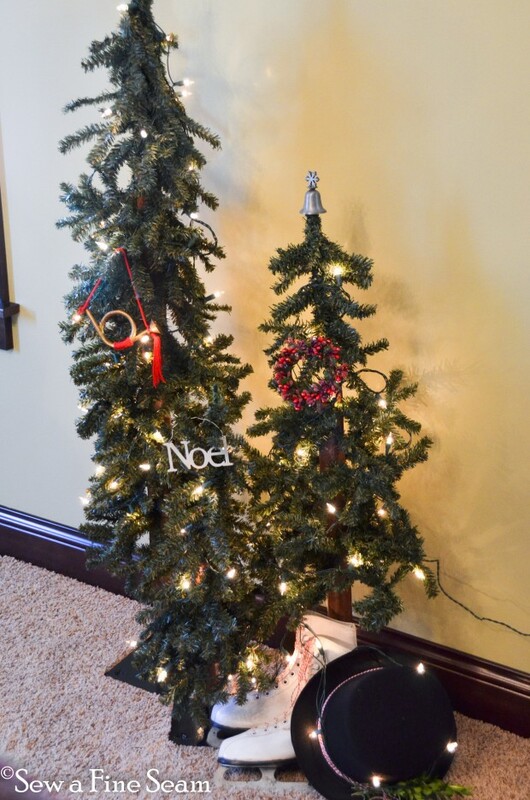 Angie’s 5 children were delighted to help out wherever they could so they set up these trees for me. Angie strung the lights and her girls added some decor. The black top hat was from the dollar section at Target. 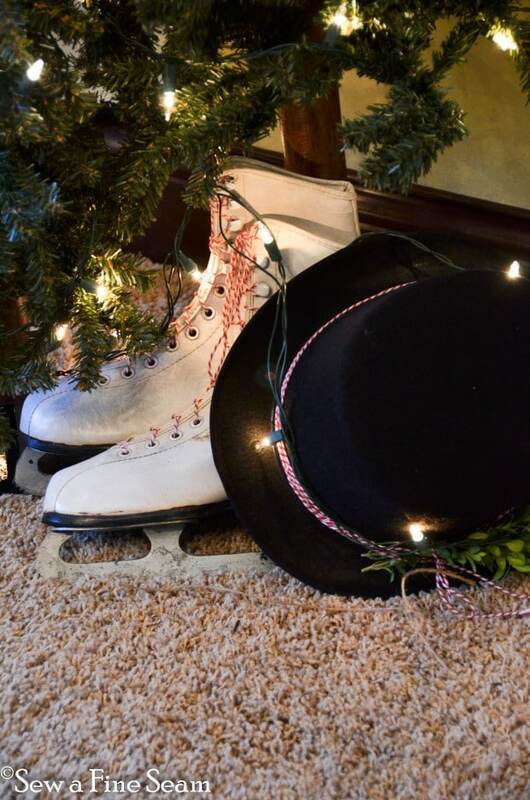 Baker’s twine adds a festive touch as laces for the skates and a ‘ribbon’ on the top hat. 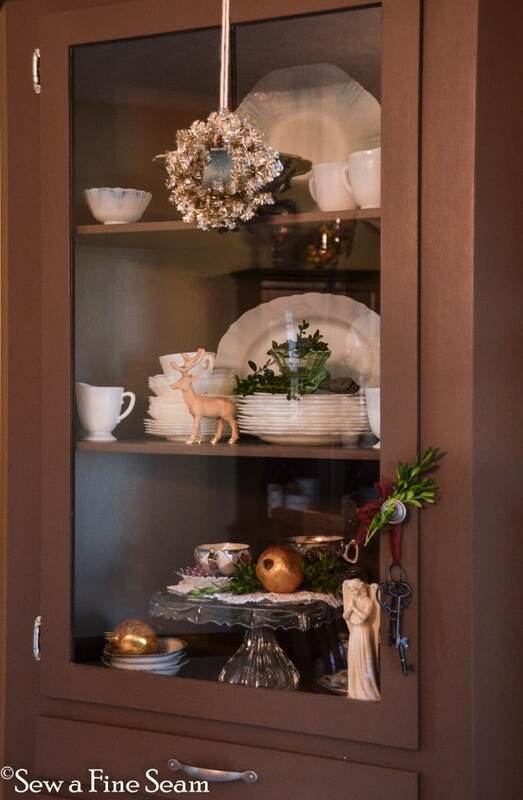 Adding some festive touches to what is already in a cupboard is a quick easy way to add holiday cheer. 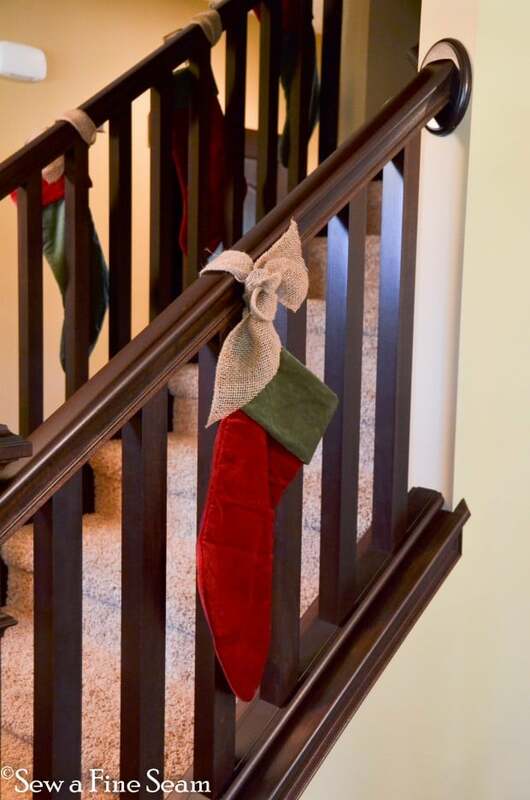 Angie had one extra stocking so we used it on the dining room side of the stairway. 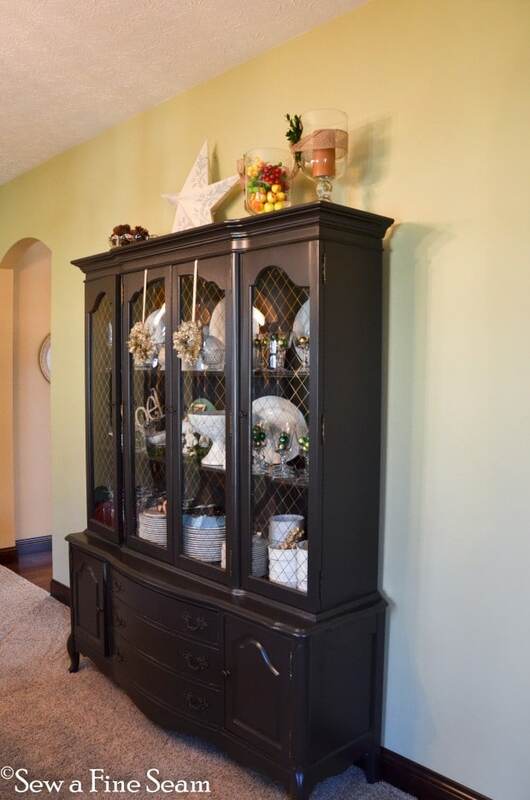 Turn around from the tree display and you see Angie’s beautiful china cupboard. 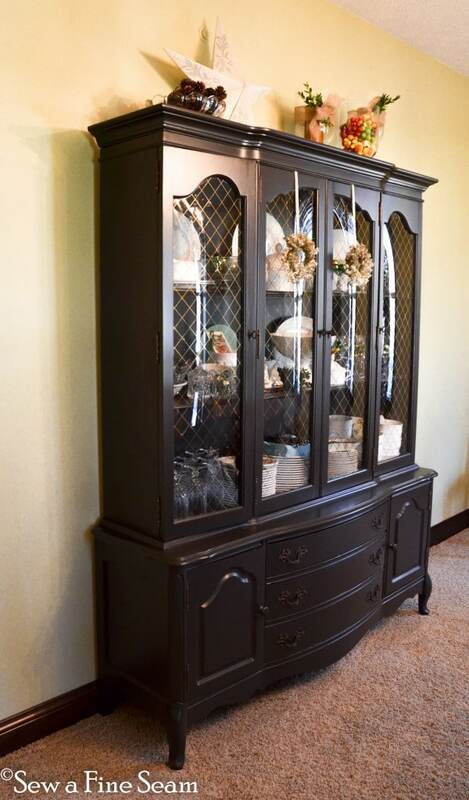 I love this cupboard! 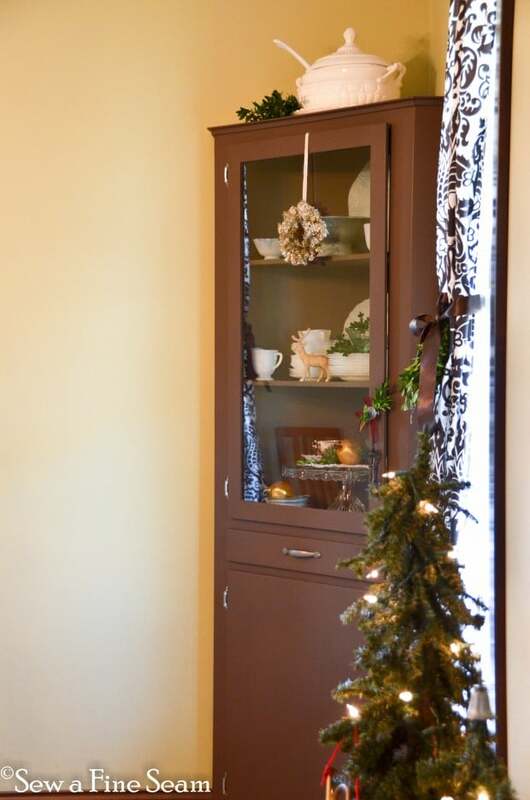 I just added Christmas-y stuff to this cupboard too. No need to empty and replace unless you really want to. The faux fruit I’ve had for years and years now too. 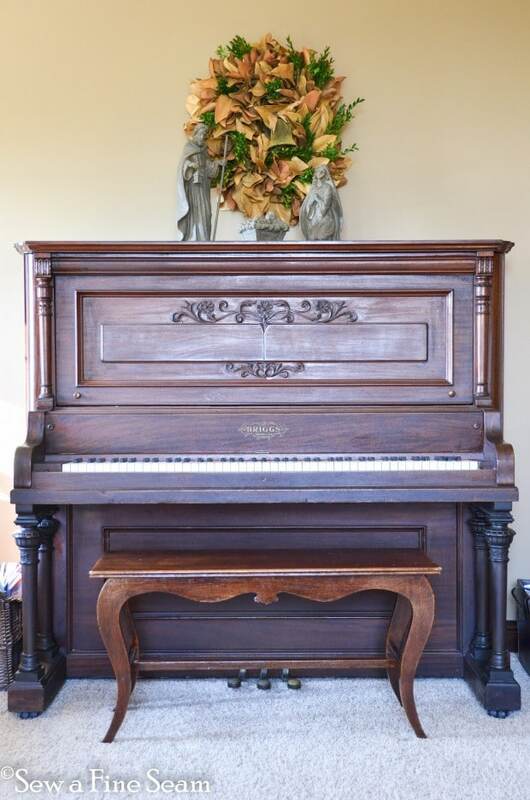 I don’t always find a spot for it in my house but it’s another thing I just can’t get rid of. 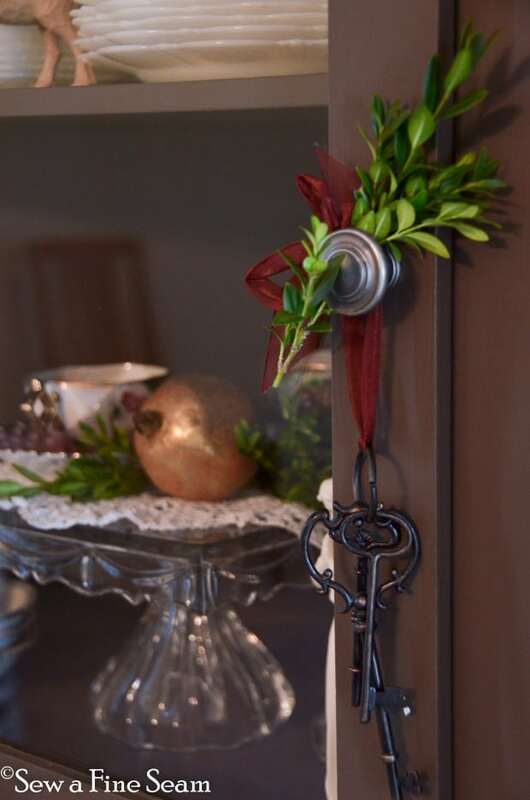 The little wreaths were a new purchase this year – I wasn’t sure when I bought them if I would use them or if I would use them at Angie’s. 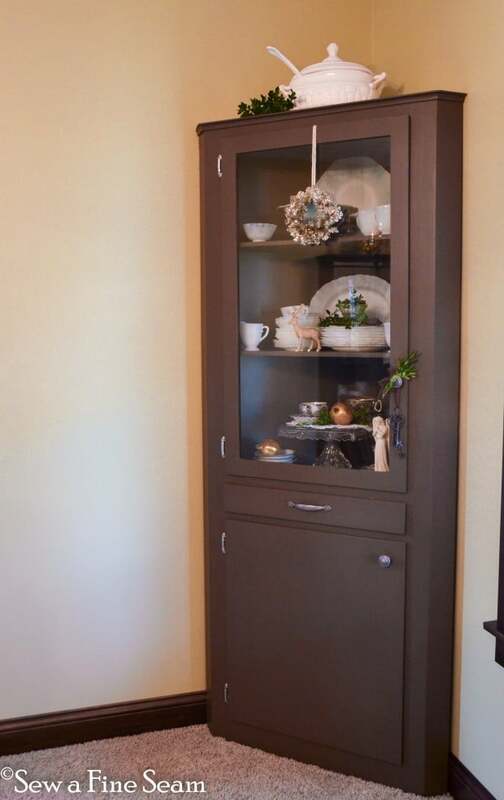 Since I didn’t find a perfect spot for them in my house I took them along and they worked great on her cupboards. 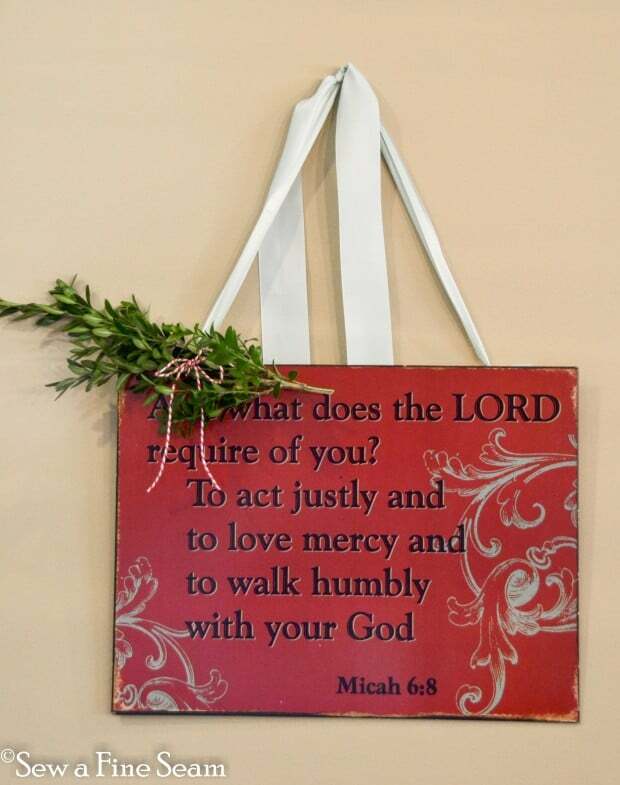 This plaque hangs on a wall in Angie’s kitchen. 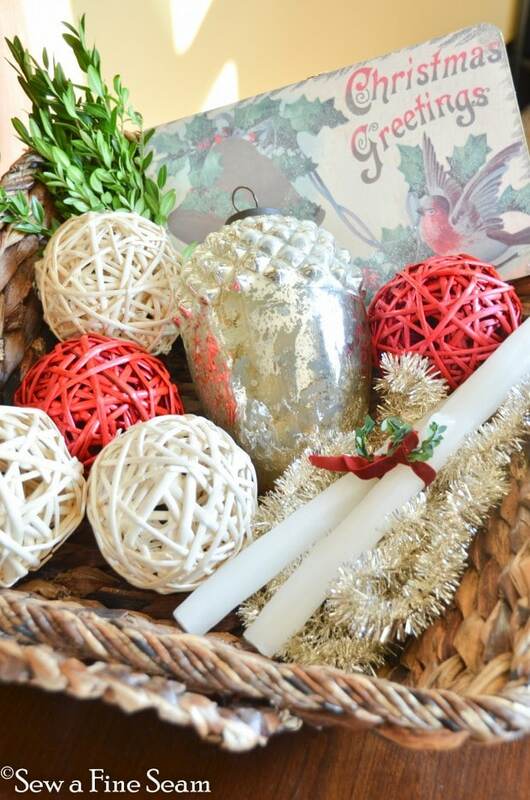 A bit of boxwood tied on with red and white baker’s twine and you have instant Christmas decor. 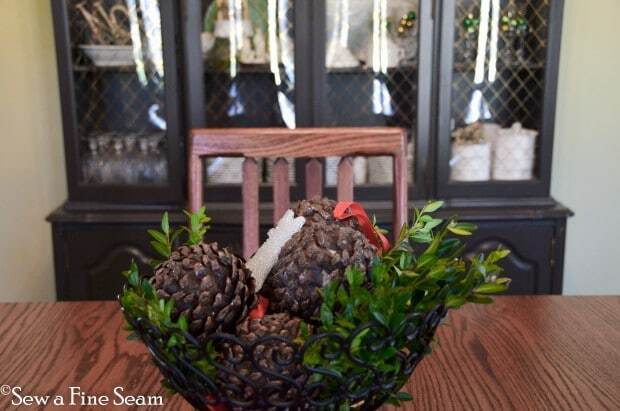 This glass urn was already on Angie’s kitchen island with the crown in it. 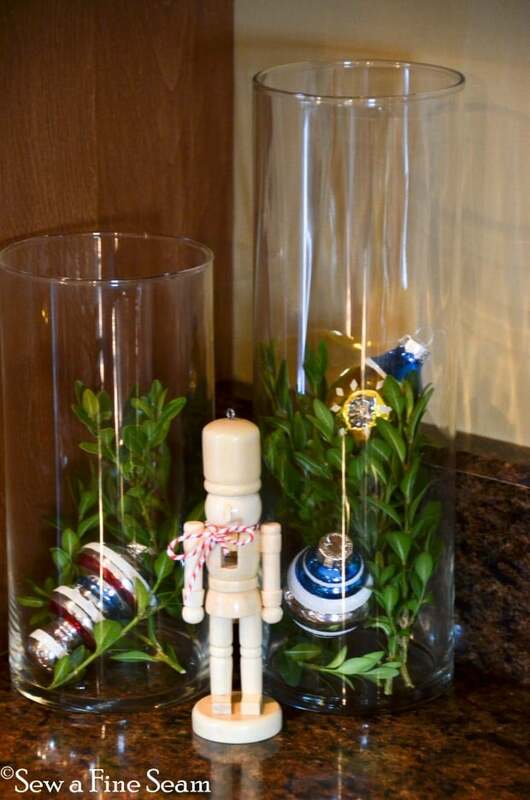 I added the boxwood and a paper ornament that is among the stash of decor I can’t part with. 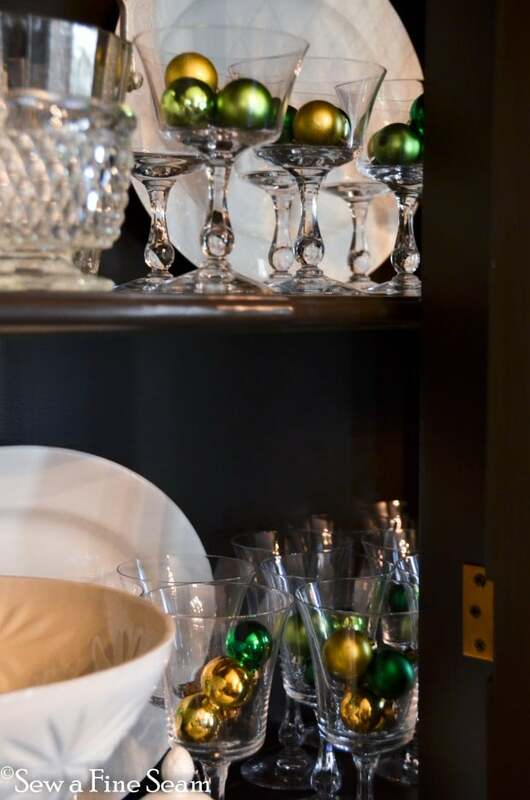 Glass vases with boxwood and ornaments and a miniature nutcracker tucked into the corner of the kitchen counter adds a bit of seasonal decor to the kitchen. 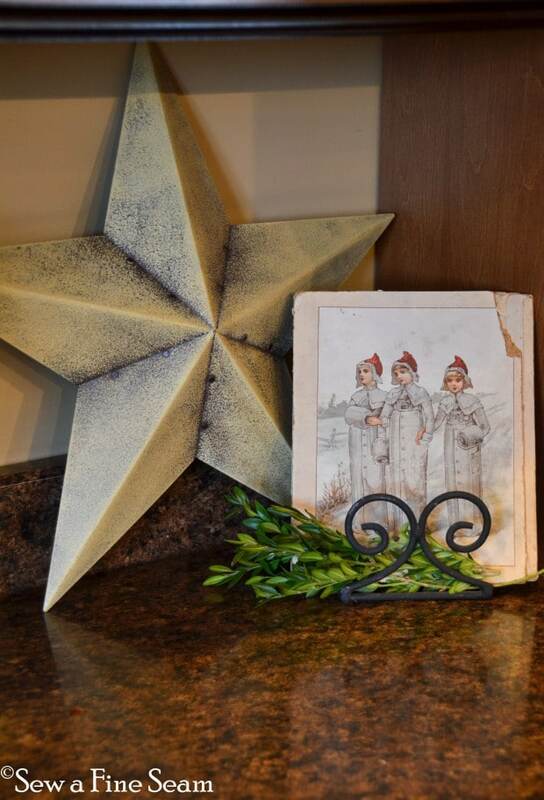 At the other end of the counter we placed a metal star and a book with a winter scene. Angie made this nativity when she was a teenager I think she said – I just LOVE it! 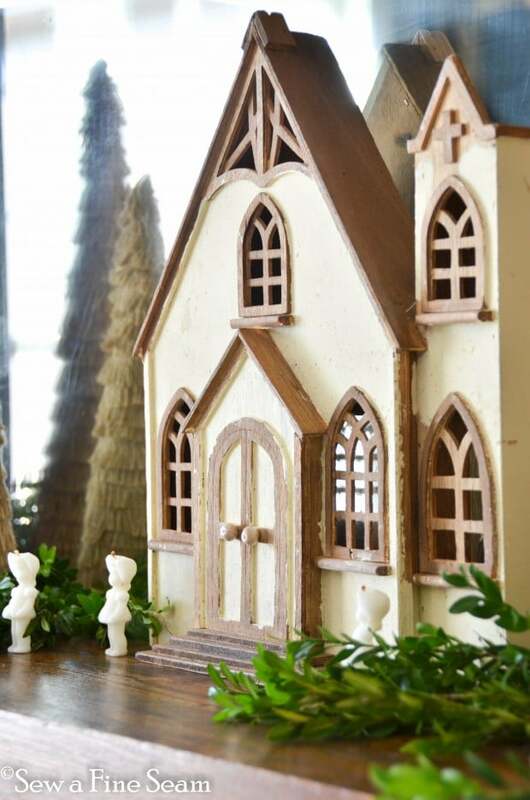 This darling wooden church is just perfect on Angie’s mantel in the living room. I found it recently at an antique shop and got it to use here. 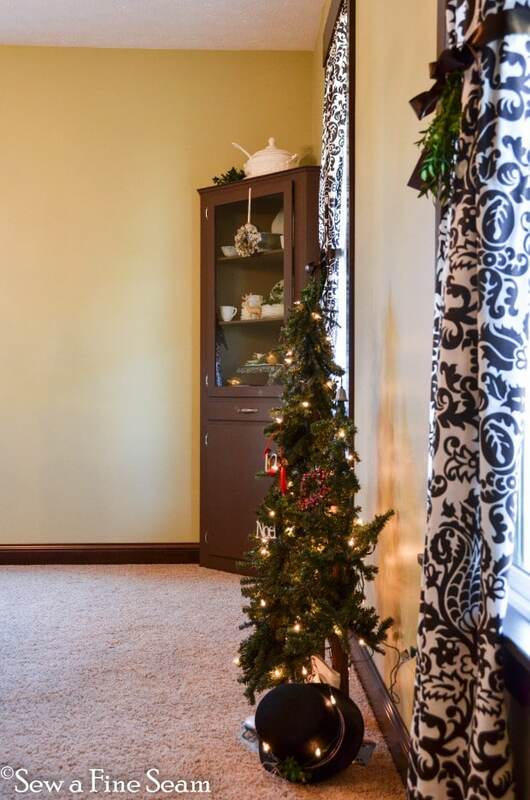 The burlap trees are from Hobby Lobby and were so cheap I couldn’t make them myself that cheap. 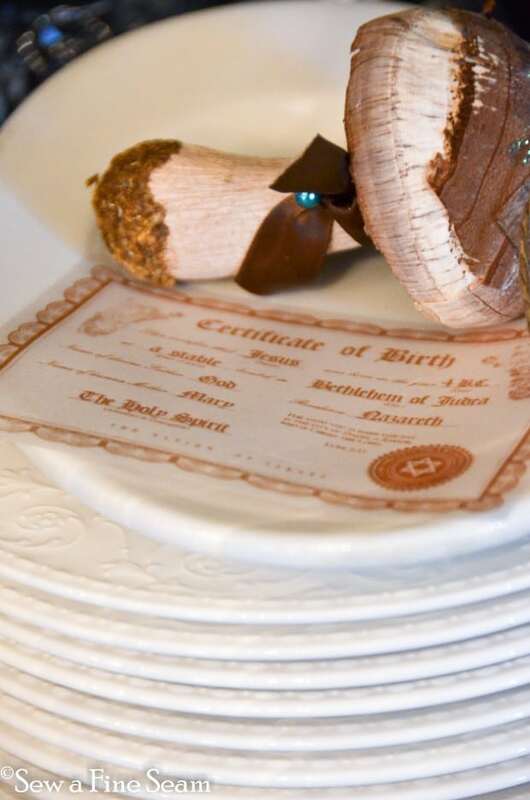 There are some tutorials out there if you have the stuff on hand and want to make your own! My friend Ann, from On Sutton Place, has a tutorial if you want one. 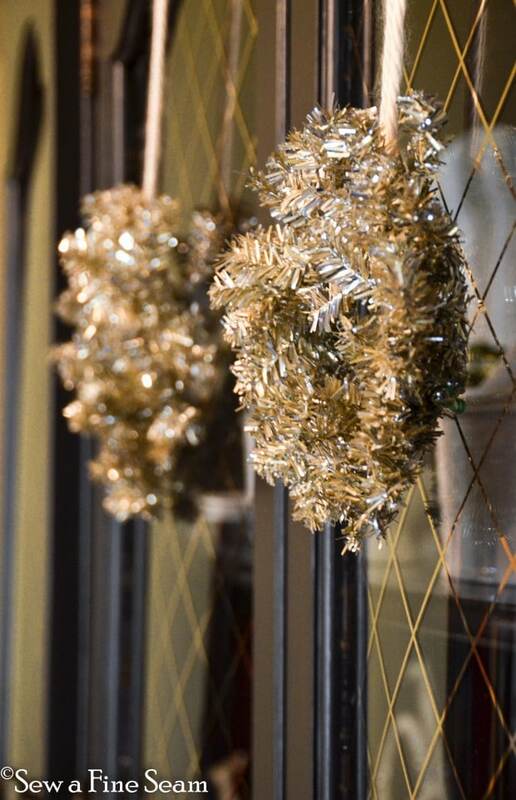 The wreath Angie has had for years. I convinced her to get it out and hang it up! Tucked some fresh boxwood in and added the bell to the center. 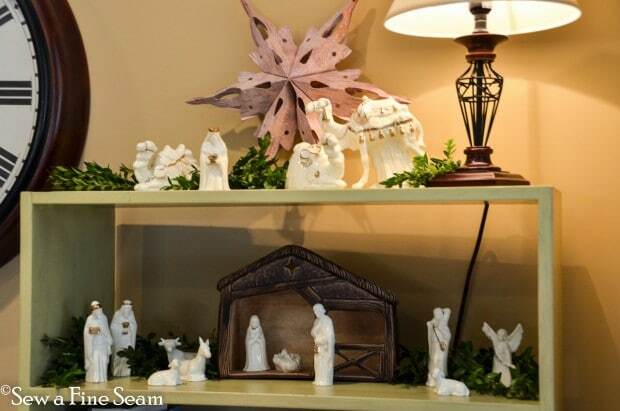 Somehow this large nativity just looks great on a piano. Angie’s girls helped me fill this basket with holiday goodies. They were such fun and were delighted to help. We put a few things in their bedrooms too and they were thrilled. I didn’t get pics of any of that though – I’ll have to go back! 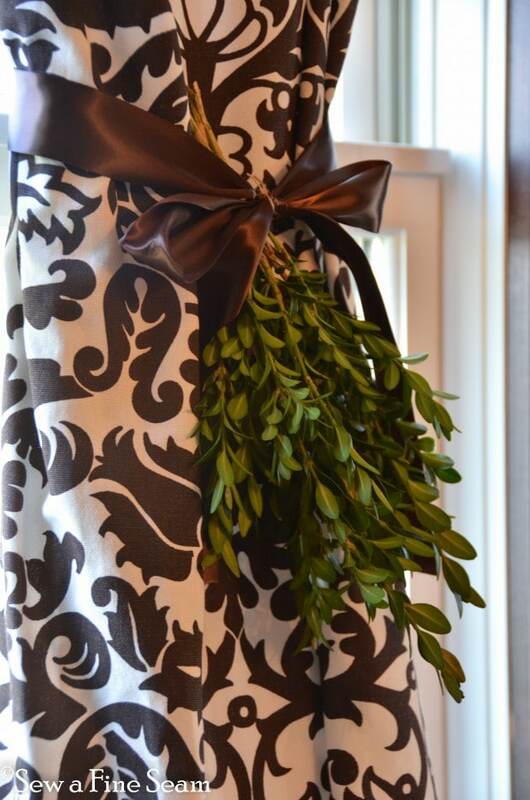 And finally, I tucked some fresh boxwood in the dining room curtains. 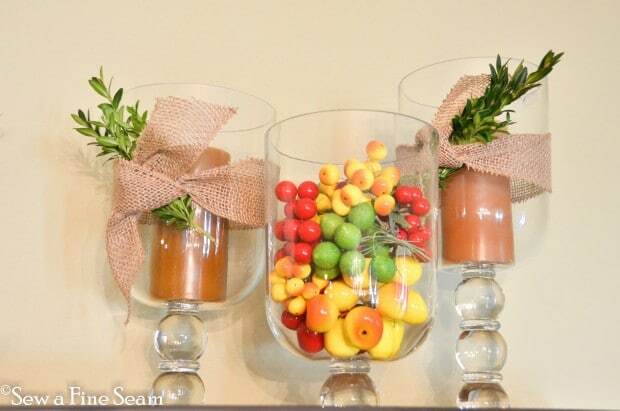 A great way to add some festivity and it’s so simple. 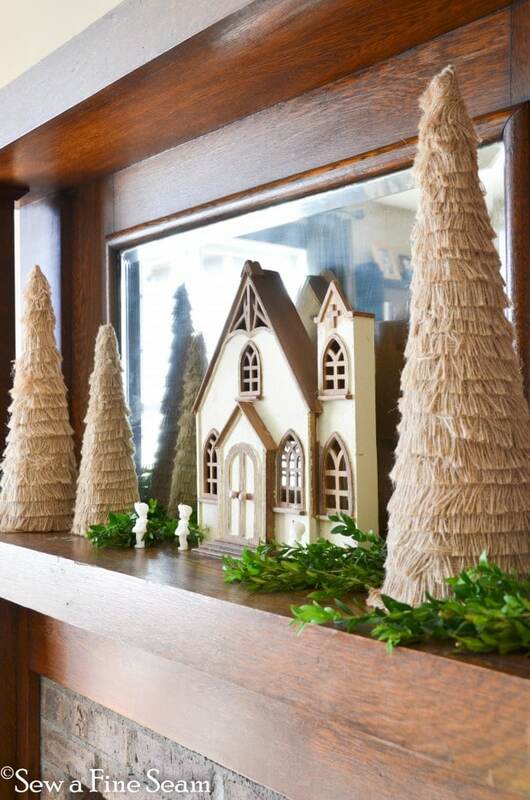 Next week I’ll share how I decorated another friend’s home! 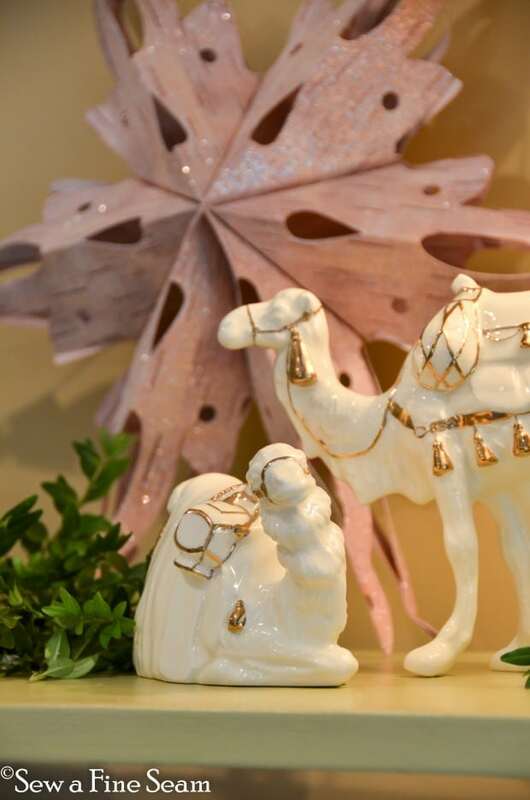 Hope your holiday preparations are going smoothly and you are finding time to slow down a bit and enjoy it. 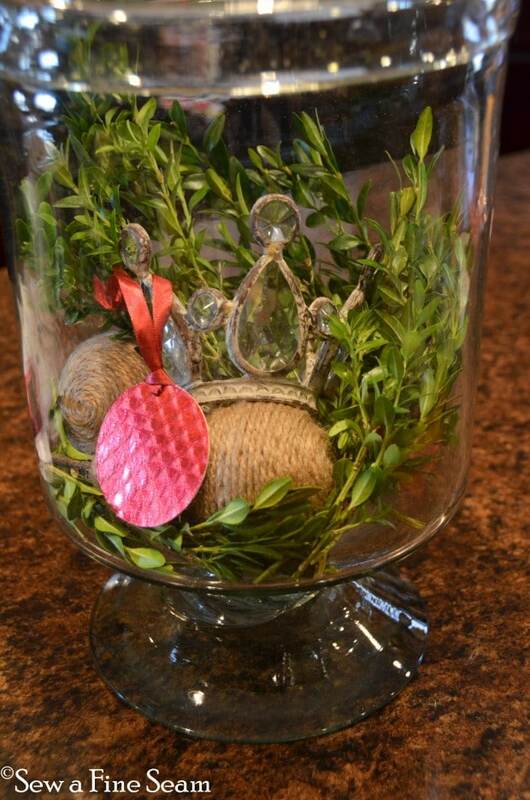 Jill, great job-loved all your creativity. 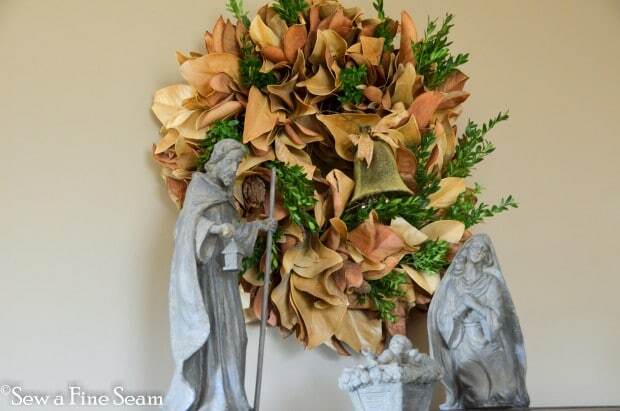 What a creative way to make that wreath look beautiful! Did you end up getting some boxwood? 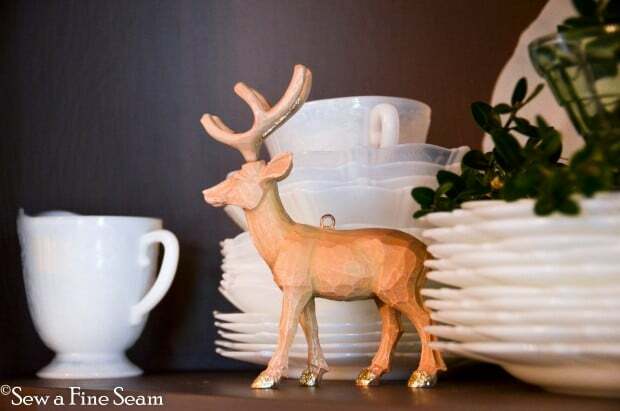 What a nice idea to decorate a friends house. 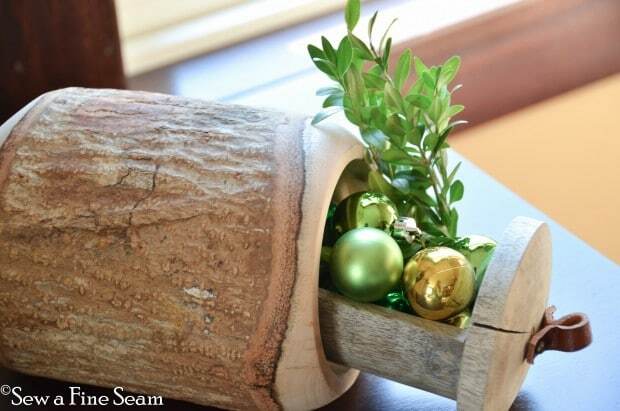 Love that you used boxwood..I often use it, mixed with other evergreens. Maybe by itself this year. 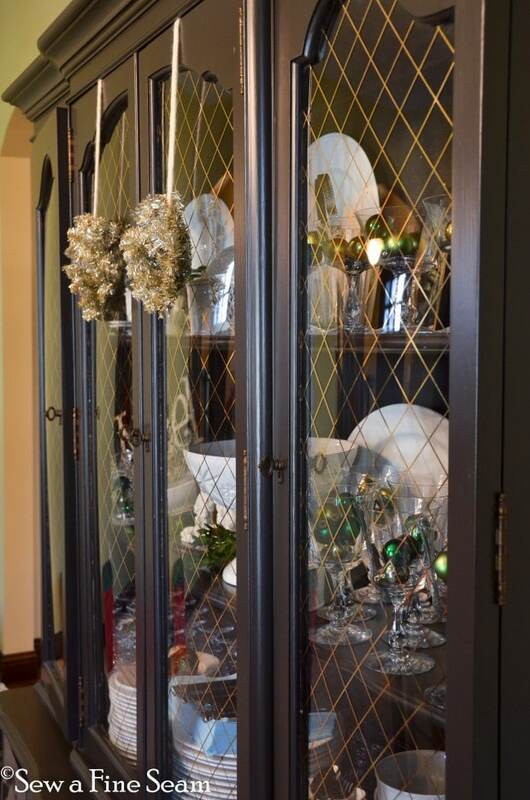 Also love the touches inside the china cabinet…nice look! 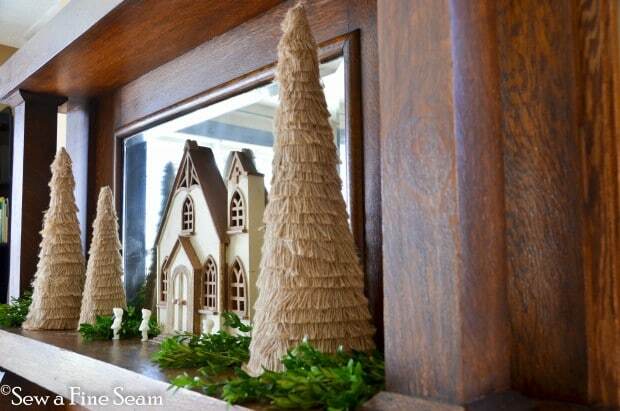 I am not sure I would have the confidence to decorate someone else’s house…you did a beautiful job! 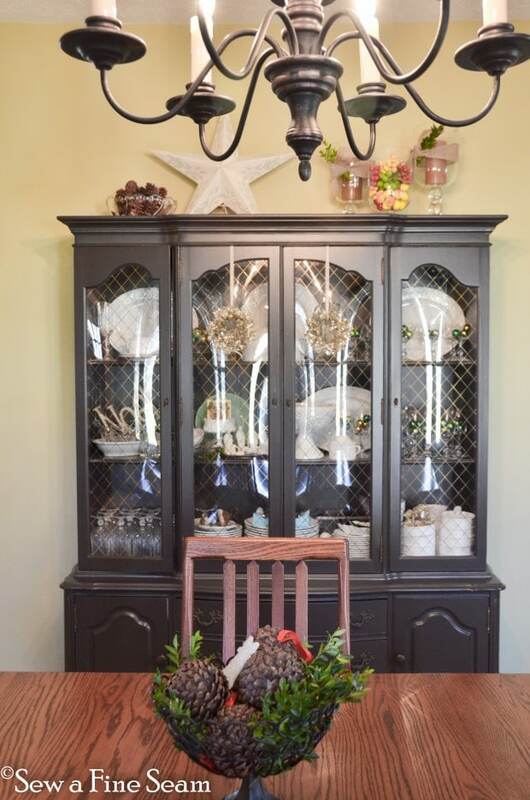 Well.. as you all can see.. Jill did a wonderful job in my home.. such a treat… it’s so fun to see how someone else works with your stuff.. such a blessings.. we are truly enjoying the fruits of her labor.. beautiful decorating.. thanks so much my friend!! 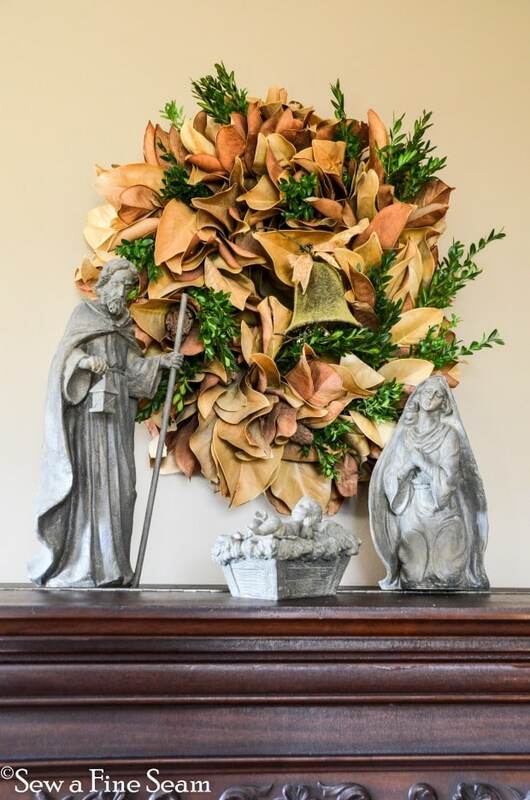 Great job Jill, love your friends old wreath, the additions are great, nice to be able to supplement the wreath with fillers. 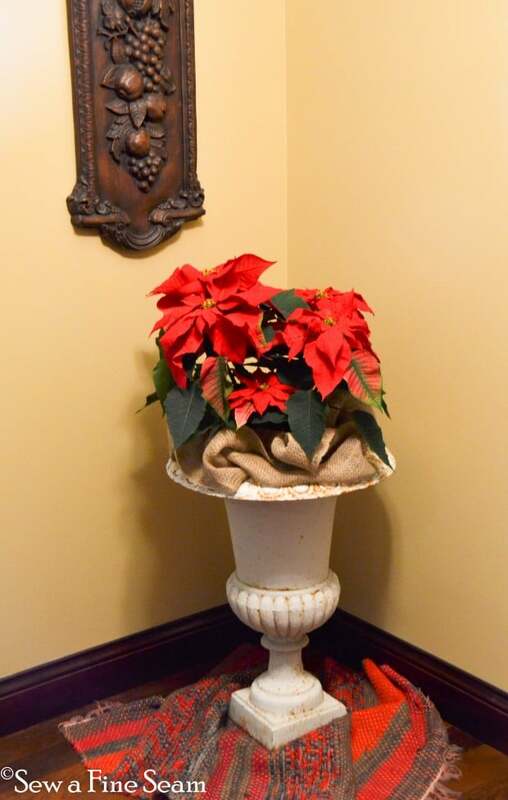 What a compliment to be asked to decorate for the holidays in your friends home. 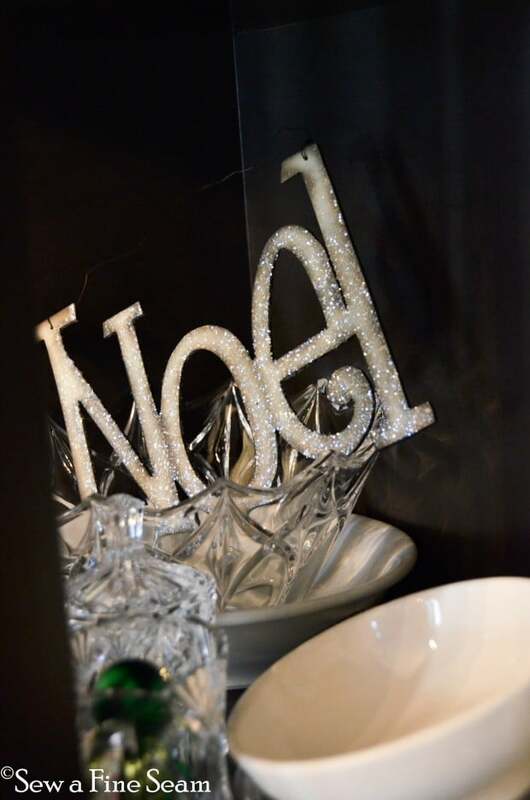 Sounds like you’re a very busy lady, styling other people’s homes and your own holiday decorating to do. Seems like there’s never enuf time to do it all.